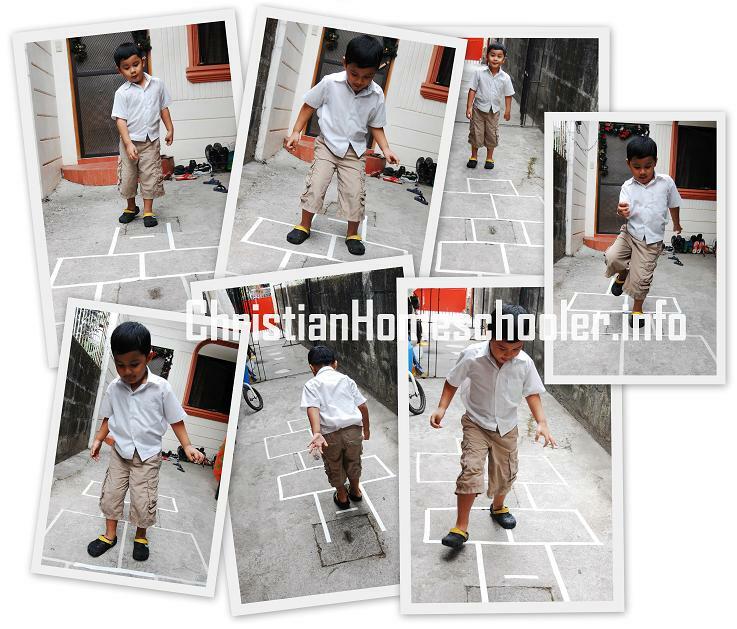 Our physical activity for today is Hopscotch. Its main objectives being: coordination, balance and directionality. Homeschooling can be pretty challenging and fun. It forces “teacher mama” (this is what my son calls me during school time) to be creative. This hopscotch game is pretty easy. It is not like I needed to make use of plastic knobs for an art activity or something. All I needed was a scotch tape and I decided to use space in front of our house. 1. Teach the child to hop on one foot in the first two squares. Making usre their foot does not step on a line. 2. Then, jump on both feet, one foot in each of the double squares. 3. Do a one-foot hop in the single square. 4. Then, do a double foot jump. 5. Do one more one-fot hop and hop out of the hopscotch court. * When the child can hop through the fomation with ease or as time permits, rather than hopping out of the hopscotch courtm ask the child to practice turning around on one foot with a hop and start back down the formation. * As my son’s supervisor, I should generally note if he can hop through the formation without putting his other foot down or stepping on a line. If my son’s hop is coordinated or clumsy and if he keeps his balance with ease. Even if I note all these down mentally, the fun that my son is having is all over his face. This is especially true if he is able to ease through the court after a few tries.